100% natural bamboo, strong and strudy. Antimicrobial, antibacteria, BPA free. 17x12.6x0.63 inches and is big, thick and sturdy. 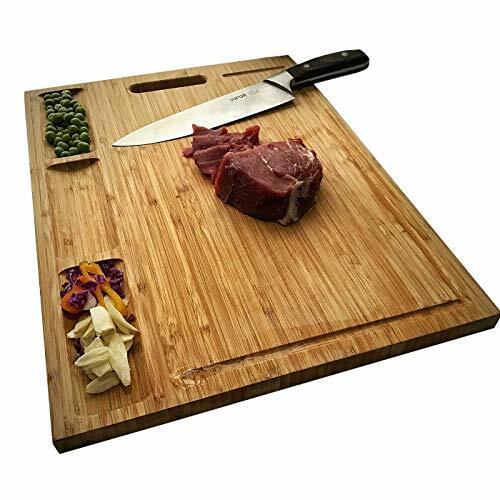 Could be used as a cutting board for fruits, veggies, cheese, heavy duty butcher block, cheese board, chopping board or a serving tray. One side with compartments and juice grooves, for cutting small veggies, fruits, etc. ; the other side with only juice grooves, large area for carving turkey. DO NOT PASS TO DISH WASHER!!! If you have any questions about this product by HHXRISE, contact us by completing and submitting the form below. If you are looking for a specif part number, please include it with your message.